Please refer to our stock # MH-15 when inquiring. Miharu Hariko papier-mache dolls of Hina Ningyo (Imperial Couple) traditinally displayed in the month of March for Girls Day (March 3rd.) Miharu Village, Fukushima Prefecture, ca. 1992. Empress: H.4.875"(12cm) x W.3.625"(9.25cm,) Emperor: H.5.375"(13.5cm) x W.3.75"(9.5cm.) Condition Note: hat of Emperor cracked and repaired. Small crack on back of Emperor where sword protrudes from body. Otherwise, good condition. Miharu-machi (town) is located just NW of Koriyama City in central Fukushima Prefecture. They say the town’s name “mi’ (3) “haru” (spring) comes from the fact that the three famous blossoms of spring; plum, peach, and cherry, bloom here in profusion. This colorful backdrop, along with a scenic rural setting, and a long craft history, help to provide the inspiration for the papier-mache dolls known as Miharu Ningyo (Miharu Dolls.) Over 300 years ago, the first ancestor of the Hashimoto family to settle in the region was Hashimoto Keibu, a samurai displaced by civil wars. His descendants began making Miharu Ningyo under the patronage of feudal lords during the Edo Period (1600-1868.) Similar in form and theme as the clay dolls produced a bit north at Tsutsumi in Sendai-han (Province) , Miharu Ningyo were instead made of scrap paper pressed over mountain willow wooden molds, then glued and hand painted. Such items were sold to the retinues of samurai and officials that were forced to travel to and from their outposts to the capital in Edo (Tokyo) under the Shogun’s “san kin kotai” (alternating residences) system. Souvenirs to take back to Tokyo were a must along the route. At the peak of the trade’s history in the 1700's some 30 families worked at this craft in Miharu, proding such items as Ebisu, Daikoku, &Daruma dolls. Today, there are about a dozen of the Hashimoto descendants continuing the tradition today at a collective of farm houses and gift shops known as Deko-Yashiki. Miharu artisans started out with paper because there were no good clay deposits in the area, but today say that paper actually creates a more lively, and expressive figurine than the stiffer, hardened clay. This can especially be seen in the dancing figures. 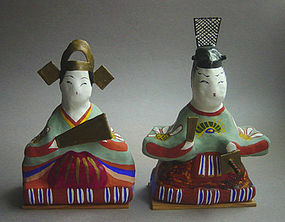 Other standards are Ebisu, Daikoku, & Daruma dolls, as well as masks, and the popular zodiac animals. To meet the annual demand for the zodiac figures, work begins in the summer months and only a limited number of the following year’s animal is made, and released for sale at year’s end. But, loyal customers don’t mind the annual wait. Today’s dolls still use high quality hand-made paper of mulberry bark fibers, and are still hand-painted by the Hashimoto family descendants in this centuries old traditional folk craft. The techinique of “hariko” (papier-mache) is said to have come to Japan from China during the Muromachi Period (1333-1568.) The making of hariko dolls, masks, and other folk toys was an industry that saw great growth during the Edo Period (1600-1868) due to an increase in regional travel by samurai retinue and government officials from outlying castle towns to and from the capitol in Edo. This was especially true in areas where paper manufacturing was already established, and where the raw materials (proper woods such as mulberry; and clean cold running water) where readily available.